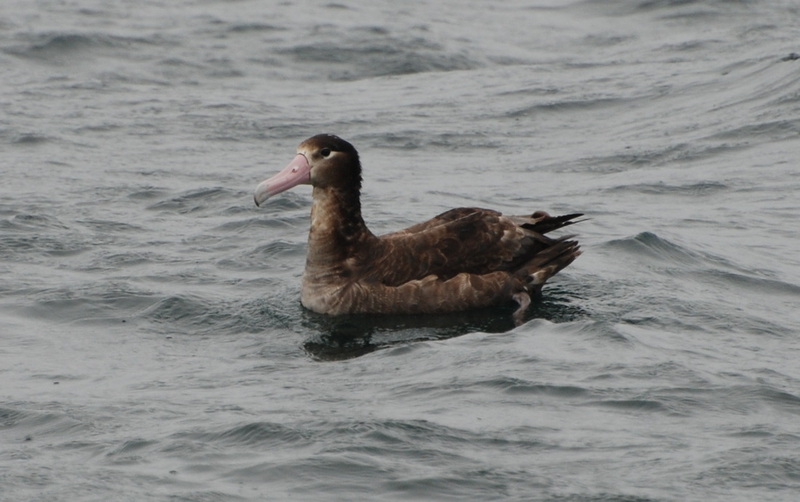 Juvenile short-tailed albatross in offshore waters along the Central Coast. Photo by Caroline Fox (www.raincoast.org). The short-tailed albatross is the largest of the 3 albatross species found along the BC coast. Its most distinctive features are its large pink bill with a pale blue hooked tip, its dark humeral feathers, and pale blue feet. Juveniles (in photo above) have mostly dark brown plumage, while adults are mostly white with dark wing and tail feathers and a a pale yellow head. The bill is usually enough to identify this species in any plumage however. See more detailed identification descriptions of juveniles, subadults, and adults on the E-Fauna BC species page. The short-tailed albatross is rarely seen along the west coast from the Aleutian Islands to California, although until the end of the 19th century it was common in this region. The large majority of breeding birds nest on a few islands off the coast of southern Japan, and non-breeding birds range across much of the Pacific Ocean. Most non-breeding birds are found along the Aleutian Islands and around the southern Bering Sea. Smaller numbers of birds are still occasionally further south, off the coast from southern Alaska to California. These numbers have been slowly increasing in recent years. See the E-Fauna BC species page for more information on population trends. The other albatross species found in waters along the BC coast are the Laysan albatross (Phoebastria immutabilis) and the black-footed albatross (Phoebastria nigripes). Neither has the distinctive pink bill of the short-tailed albatross; the black-footed albatross' beak is usually dark, but is occasionally a dull, dusky pink. Adult short-tailed albatrosses have both dark and light patches on their wing tops, while the adults of the other species have nearly completely dark wing tops. Juvenile short-tailed albatrosses may be confused with adult black-footed albatrosses, but the pink bill is usually distinctive enough for proper identification. The blue bill tip appears as the bird ages. Conservation: Until the early 20th century the short-tailed albatross was harvested for its feathers at breeding colonies on islands off the coast of Japan. This is the main reason for its drastic population decrease: populations were decimated by large harvests within less than two decades. The species was at one point thought to be extinct; since then conservation efforts have increased numbers, though populations remain at precarious levels that could rapidly dwindle again. The short-tailed albatross is vulnerable to a number of threats due to its low numbers and small breeding range (it is only known to breed on one island). Such threats include oil pollution, bioaccumulation of pollutants, plastic ingestion, and entanglement in abandoned, lost, and active fishing gear, as well as natural threats like volcanic eruptions. It is a red-listed species in BC, and is designated as threatened by COSEWIC (2013). It is protected under Canada's Species At Risk Act. albatrus in Canada. Committee on the Status of Endangered Wildlife in Canada. Ottawa. Dunn, J. L. and Alderfer, J. (Eds.). (1999). National Geographic Field Guide to the Birds of North America. (3rd Ed.). Washington, D.C.: National Geographic Society. Pp. 28-29. Phoebastria albatrus (Pallas). In Klinkenberg, Brian. (Ed.). E-Flora BC: Electronic Atlas of the Plants of British Columbia. Lab for Advanced Spatial Analysis, Department of Geography, University of British Columbia, Vancouver. Accessed 23/04/2014. Short-tailed albatross (Phoebastria albatrus). ARKive. Wildscreen. Accessed 23/04/2014.